LOS ANGELES (AP) — All-Star outfielder George Springer left Houston’s game against the Los Angeles Dodgers after injuring his left thumb trying to steal second base in the third inning Sunday. 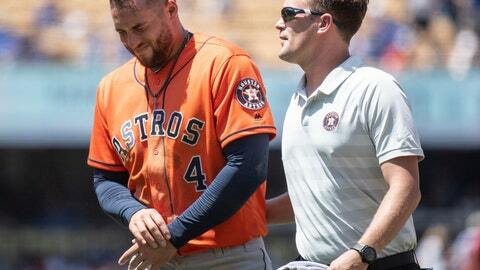 Springer exited with discomfort in his thumb following a headfirst dive into the bag. He was thrown out by Dodgers catcher Yasmani Grandal. It’s unclear how long the 2017 World Series MVP might be sidelined. Jake Marisnick replaced Springer in center field for the Astros. Marisnick robbed Taylor of a home run to end the sixth. Springer was the World Series MVP last year after hitting five home runs in seven games against the Dodgers. He went deep in the first inning Sunday for his sixth leadoff home run this season. The two-time All-Star also left Tuesday’s game at Seattle when he injured his left shoulder while diving to make a catch in the first inning. He was not in the Astros’ lineup Wednesday. Springer started all three games in the weekend series against the Dodgers, getting an extra-base hit in each game of the World Series rematch.